I wish I had re-read my 2009 report before this year's OSP, especially the part about not planning an observing program. But, I was really busy at work, and besides I wanted to concentrate on the Perseids for the first couple of nights. So, this turned out to be another OSP that I approached without a real plan. I did get out and around on my feet during the daytime, possibly to the detriment of my nighttime stamina. The environs seemed unusually lush this year, so I took a number of short hikes. For daytime photos as well as some informal astrophotography, please visit my OSP Photo Companion. It was a clear morning in Chiloquin after a couple of days of unsettled weather. Actually, skies were pretty good almost all the way to Prineville, but when I stopped at Ochoco Reservoir for lunch I encountered some pretty heavy showers. When I reached OSP, it was still cloudy. I wondered if I should have stayed home and caught the Perseid pre-maximum from Chiloquin. I took a nature hike while I pondered this. Luckily, the clouds departed in the evening, revealing the thin crescent Moon and the planetary trio of Venus, Saturn and Mars. While waiting for the Perseid radiant to gain altitude, I scoped out a couple of comets. 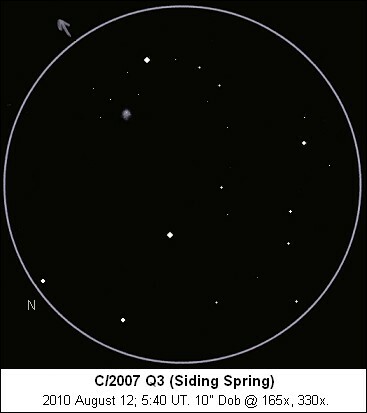 Comet C/2007 Q3 (Siding Spring), in Bootes, had been fading for a long time, but I hadn't attempted to observe it before. Thanks to being very small and condensed, it was still just visible in my 10" scope. I noted it as pretty faint and quite condensed. Its small (~45 arcsecond) coma had well-defined edges. A stellar nucleus was especially apparent when I bumped the power up to 330x. The coma appeared slightly extended to the NE. Comet 103P/Hartley was on the other side of its light curve, brightening rapidly on course to become a faint naked-eye object in October. At OSP time, it was in Pegasus, still quite faint and slightly more difficult to see than C/2007 Q3. In my notes, I called it very faint and ill-defined. The 2-arcminute oval coma was not very condensed, with diffuse edges that became more apparent with extended viewing. Limiting magnitude during the evening was 7.0, about average for OSP and fairly typical of the next few nights. I tried for another comet, 65P/Gunn in Microscopium, but this faint and far-southern comet eluded me as it would for the rest of the star party. I took a bit of a break/nap before turning to Perseid observing. My aging tape recorder decided to record selectively, so I abandoned it and went back to the low-tech method of writing meteor shower associations and magnitudes down in a notebook, blindly. This worked just as well, but was a bit less comfortable. I wound up counting meteors from 2:15-4:00am. In this time, I saw 103 Perseids and 40 other meteors. The highlights were Perseid fireballs at 3:11am and 3:37am that left glowing trains that were visible for 6 minutes and 10 minutes, respectively. The Perseids seemed bright on average, with a mean magnitude of 1.5. In comparison, the mean magnitude of the sporadic (random) meteors was 2.9. In anticipation of the Perseid peak, I blocked out the entire night for meteor observing. This meant neglecting an impressive run of events involving Jupiter's satellites and their shadows. I moved my sleeping bag out of the main OSP site. In addition to counting meteors, I hoped to photograph a few. Early on, the Perseids seemed faint and few. This picked up at times. All in all, the meteors seemed to be coming in more spurts and lulls than on the previous morning, and at about the same rate. In fact, in spite of the dead periods the morning rates were quite a bit better, exceeding 100 Perseids/hour during the last couple of hours before morning twilight. Overall, in 4.1 hours of observing, I counted 325 Perseids and 74 other meteors. While there were no Perseids quite as spectacular as those on the previous night, the mean magnitude during the dark hours was still quite bright at 1.8 (vs. 2.7 for the sporadics). The Perseid rates kept increasing until morning twilight got bright, possibly (or possibly not) reflecting a predicted secondary peak at around 5:00am. My final twilight-shortened period ending at 4:47am featured 67 Perseids in 36 minutes for a rate of 112/hour. The previous Perseid maxima I observed from OSP were in 1994 (an outburst year following the return of Comet Swift-Tuttle that featured a peak hour of 179 Perseids and some spectacular fireballs) and 2004 (another year of enhanced rates, with a peak hour of 127 Perseids). Even if 2010 didn't reach those levels, anytime I see 100 meteors per hour I consider that an impressive shower! And, I did catch quite a few meteors on camera, even if most of them were faint. And just being out in the desert under the stars, with the zodiacal light extending into the zodiacal band and reaching across the sky, was peaceful and healing. OK, so this should have been the night I put real effort into observing. Unfortunately, in spite of my best attempts to get some sleep during the daytime, I got tired really quickly. The night started out with a really nice show of the Moon and planets in the western sky. I messed around with some evening deep-sky observing, but my heart really wasn't in it. I ended up taking a nap during the middle of the night, and waking up for some morning observing. I revisited Comet Hartley, and also sketched the two remaining comets on my list. Both of these were old friends that I had observed previously this year. 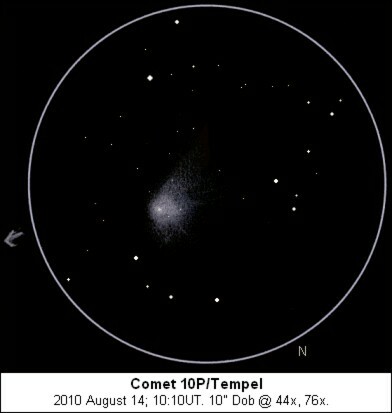 Comet 10P/Tempel was the brightest in the sky, and the most interesting to observe. It was visible as a hazy spot in binoculars. In the 10" Dob, it showed a bright, fan-shaped coma about 10' across and with several extensions reaching up to 15' from the nonstellar nucleus. 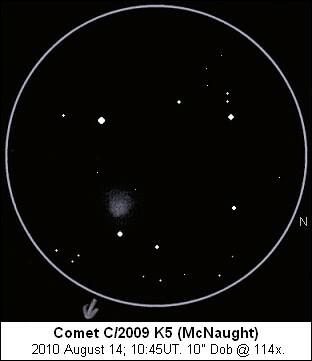 Comet C/2009 K5 (McNaught) reached maximum brightness in the spring, and had faded. It was still the second-brightest comet in the sky, and an easy catch in the scope. It showed a fairly bright but weakly condensed parabolic coma, with the brightest part of the coma displaced to the west. The highlight of the morning, however, was Jupiter. The atmosphere was quite steady by the onset of morning twilight. There were some bothersome undulations when I tried to push the power above 200x, but on the other hand a copious amount of detail was visible on the gas giant's disc even at lower powers. The Great Red Spot (more of a pinkish orange) was just coming around the following limb. It was made more conspicuous by the attenuated South Equatorial Belt, visible as a faint ghost of its normal self. There was also a thick white border area around the Spot, giving it a bullseye aspect. The south temperate belts preceding the spot were full of fine lumpy detail. The North Equatorial Belt was well-defined and shot through with detail, including a bright white bay on the northern edge, preceded by a dark barge. There were several intermittent belts in the north temperate regions. On my last night of viewing, I finally decided to sketch a couple of deep-sky objects. 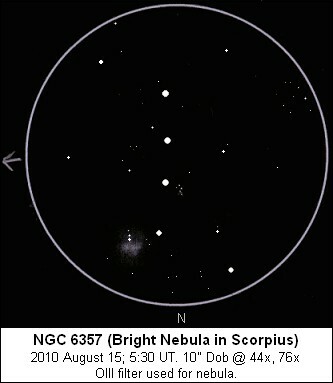 The far-southern bright nebula NGC 6357 in Scorpius had intrigued me before, but I couldn't remember ever observing it. There is a large, faint area of nebulosity that was beyond my reach, at least from this latitude. However, the bright central portion of the nebula was easily visible. This was a 5-arcminute x 3-arcminute double-lobed area aligned east-west. Both lobes had brighter centers, and a string of 3 faint stars extended about 5' to the south. The larger field features a line of four bright stars aligned N-S. The star cluster Pismis 24 is also in the field; however, it just appeared as a dim spritz of 7 or 8 faint stars. 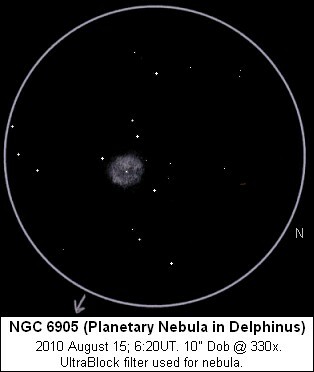 The other deep-sky object I sketched was an old favorite, the planetary nebula NGC 6905 in Delphinus. This is a relatively bright planetary with a disc about 40 arcseconds across. It takes magnification well, so I was able to use 330x (my 7mm Nagler with a 2x Barlow) with no problem. The nebula's nickname is the "Blue Flash Nebula", but the color is more apparent at lower powers. At high power, the disc showed a lot of irregular detail. The central star was easily visible. 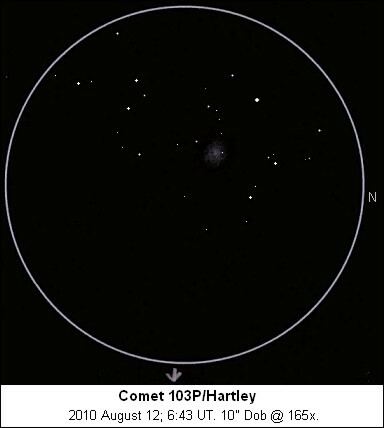 I struck out again on Comet Gunn, and for some reason I couldn't relocate Comet Hartley this evening. I trekked down to Dan Gray's 28" scope, where Dan, Cathy, Leo Cavagnaro from Argentina, and a number of other astronomer acquaintances had gathered to view faint galaxy groups and other deep-sky treats. In the early morning, I did one last Perseid count. With the shower more than two days past its peak, I counted 20 Perseids and 18 other meteors in one hour. Bright meteors were notably absent in this small sample; the mean magnitude of the Perseids was 2.1 and that of the sporadics was 3.0. I messed around with observing some galaxies in Cetus, but once again my attention shifted to Jupiter. I caught the planet a bit earlier this morning, and managed to see the side of the planet just following that which I had sketched on Saturday. 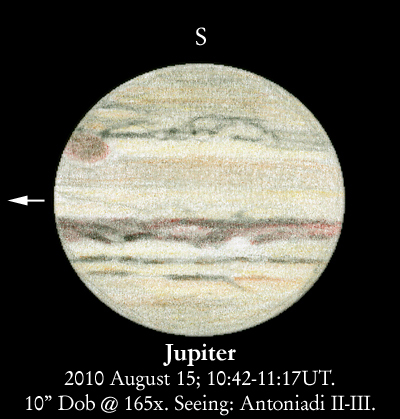 The Great Red Spot was just disappearing around the preceding limb. 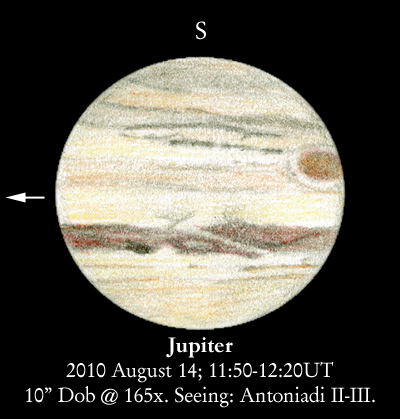 "Red Spot Jr." was ill-defined but visible as a break in the temperate belt just to the south of the larger spot. The south temperate belts following the GRS were full of looping detail, dark pinpoint spots and diffuse light ovals. Another bright northern bay was visible in the North Equatorial Belt, and the interrupted belts in the northern temperate region were dark and well-defined at these longitudes. Twilight came again, and I retreated to my sleeping bag for the last time. I'll probably remember this OSP most of all for the incredibly benign weather. After the first day, there was no threat of clouds. Daytime temperatures were warm but not uncomfortably so, and only the first night had a bit of a chill to it. Smoke from forest fires stayed very near the horizon. Sky conditions were unremarkable for OSP, but better than I get at home. There was very little of the auroral glow that sometimes brightens and colors the northern horizon out at this dark site. I headed back to diurnal life feeling that I would have liked to stay a bit longer. Perhaps that's the true measure of a positive star party experience.